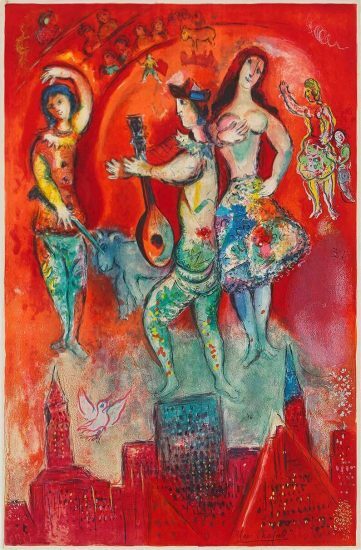 This work is stamped with the 'MADOURA PLEIN FEU' and 'EMPREINTE ORIGINALE DE PICASSO' pottery stamps on the reverse. 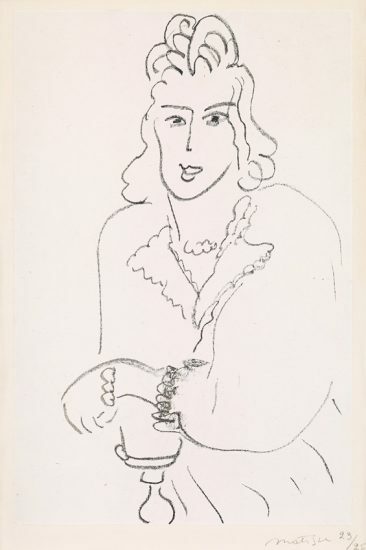 Picasso Faune Cavalier (Cavalier Faun), 1956 depicts a faun on horseback carrying a stick in one hand, and a glass in the other. The faun is twisted so that its torso and face are facing outward. 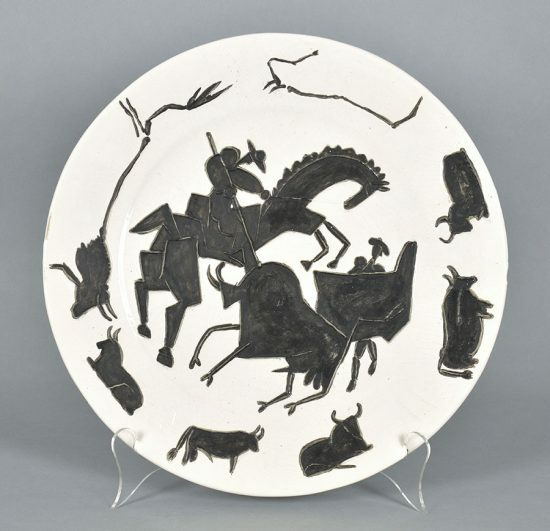 The boarder of the dish is filled with smiling faces, and the one directly above the head of the faun is almost the same as the faun – the spikes coming of the head mirror the hair and ears on the faun. Fauns are half-man, half-goat creatures originating from Roman mythology that are often associated with music because of the faun god Pan and his famous pan-pipes. Fauns are also sometimes closely associated with the ancient Greek Satyrs, also half-man half-goat, but in general portrayed as more grotesque and promiscuous than fauns. Both have close links to Dionysus (Roman name Bacchus), the god of wine. 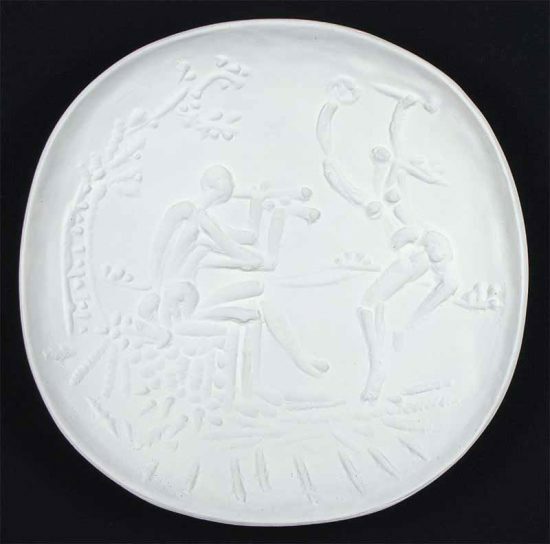 This link explains the glass held in the left hand of the faun – most likely containing wine. Fauns and satyrs both lived in the forest and were considered of a lower status than their human counterparts. 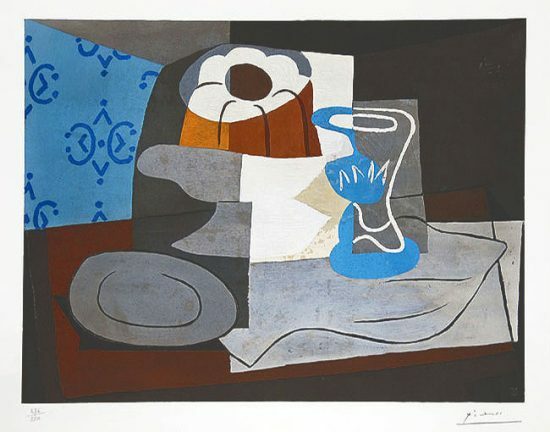 Picasso is one artist in a long line of those who draw on ancient Greek and Roman mythology as inspiration. Many before and after him play with similar themes, executing exquisite portrayals of fauns. 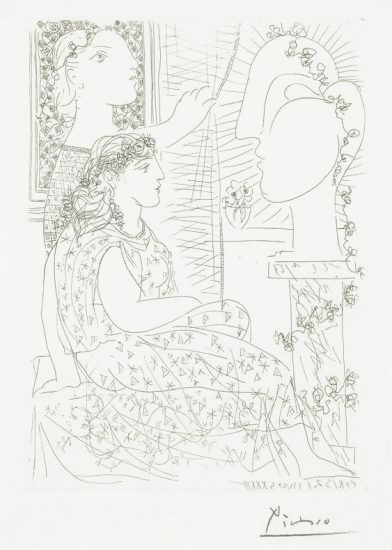 Picasso has added an excellent piece to this lineage, portraying his take on a faun with clean lines, creating an abstracted scene that is full of life. 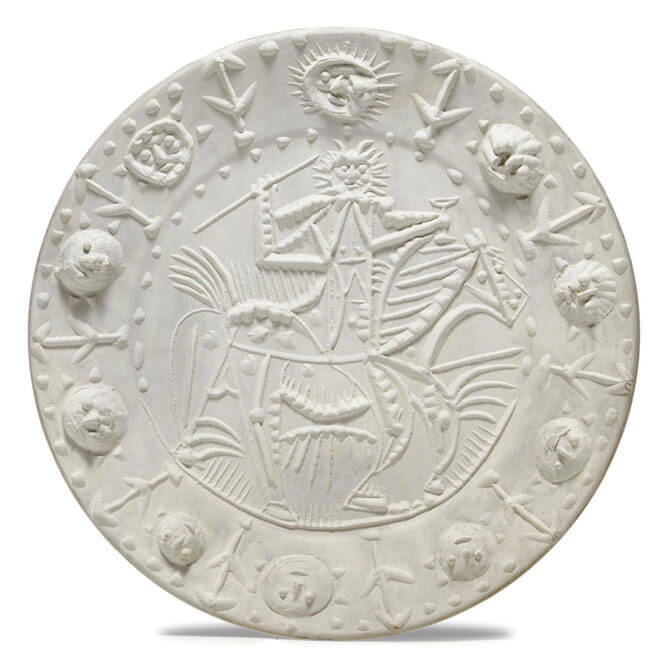 Created in 1956, this Madoura ceramic round dish of white earthenware clay is stamped ‘EMPREINTE ORIGINALE DE PICASSO’ and ‘MADOURA PLEIN FEU’ on the underside. 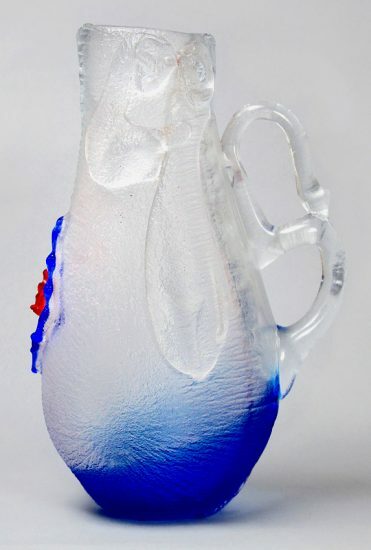 The ceramic is from the total edition of 100. 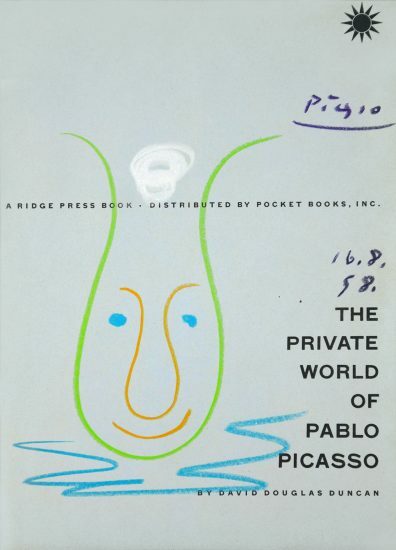 Picasso Cavalier Faun (Faune cavalier), 1956 is fully documented and referenced in the below catalogue raisonnés and texts (copies will be enclosed as added documentation with the invoices that will accompany the sale of the work). 1. Ramié, A. 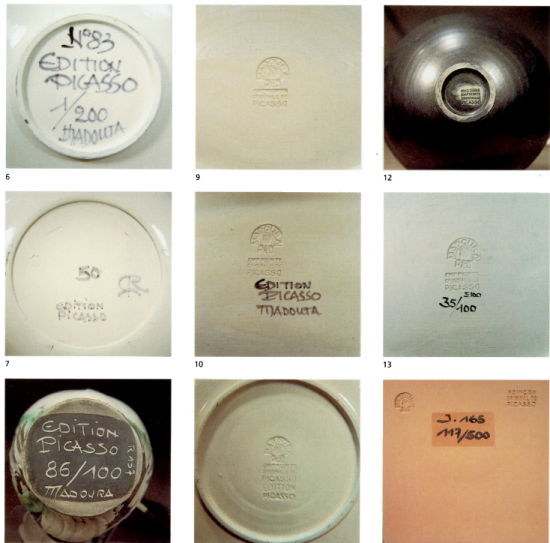 (1988) Picasso Catalogue of the edited ceramic works 1947-1971. Listed and illustrated as catalogue raisonné no. 336 on pg. 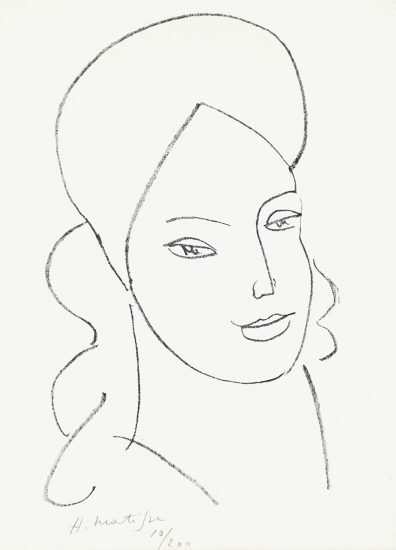 172 (another example illustrated).